Doonan diddly-squat: Sewing for my sinhs! I started this blog in 2009 when I became a full-time caregiver. 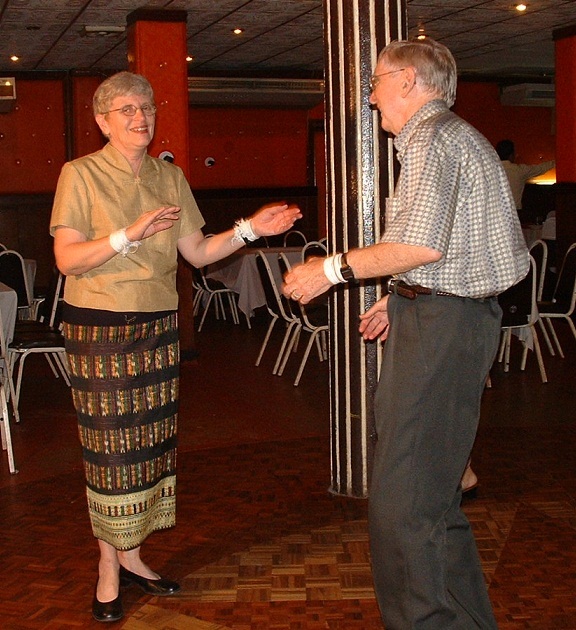 My husband had been diagnosed a few years earlier with primary progressive aphasia. Over the next four years until his death in 2013, we went on a journey of discovery about this rare condition. 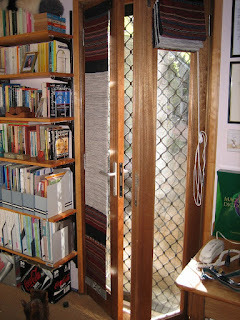 My blog is about what I learned, how we both coped and how the journey deepened our love and appreciation of each other. Allen’s journey is over, but mine goes on. Continuing on from yesterday's post, here are a couple of completed projects from my home furnishings sewing lab! 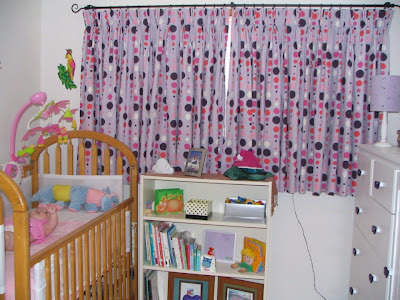 First, a set of triple-pinch-pleated drapes made for grand-daughter Charlotte's first bedroom. These are made of a very heavy cotton and lined with block-out fabric to encourage daytime napping! The panels in these blinds are fabrics that contain mainly cotton threads but also some silk. Black is used as a common background for the more colourful threads, all of which are hand-dyed. 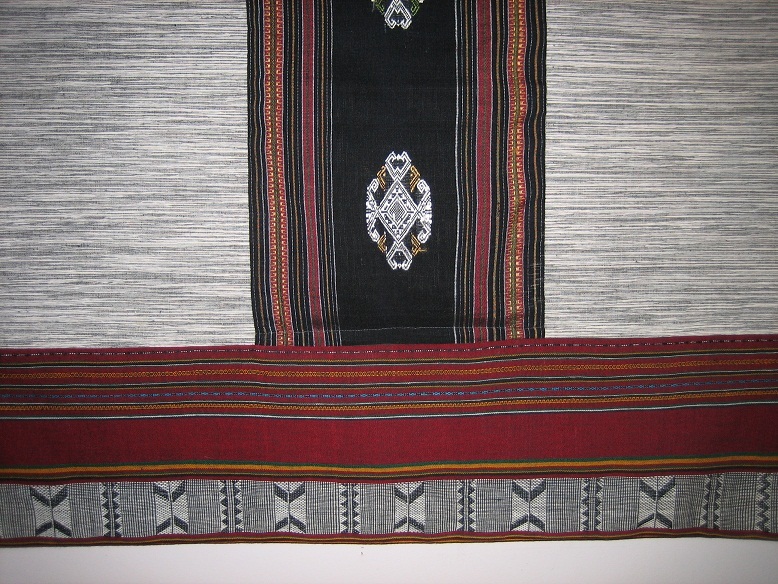 If you want to know more about Lao textiles, the website of the Taykeo Textile Gallery is a good place to start. 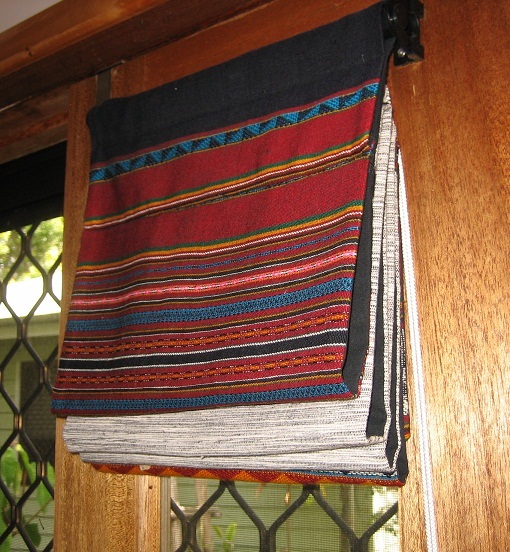 All of the insert panels came from lengths of cloth intended to be made into the traditional Lao sinh, or skirt, worn by most women in the lowland cities, towns and villages of the country. 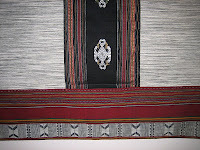 Some sinhs are woven entirely from cotton threads, but sometimes newer synthetic yarns may be used as well. However, for special occasions sinhs are made from 100% handspun and hand-dyed silk threads, handwoven and sold in lengths suitable for making one skirt. Prices for sinh lengths ranged from a few dollars to $30 or more (this was in 2002-04, when tourism in Laos was just taking off; no doubt today's prices are higher).Each sinh package consists of two parts: a larger piece for the body of the skirt, and a smaller panel used as the bottom edging. 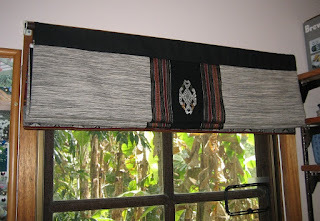 This smaller panel often has a more elaborate weaving pattern but it may feature the same threads as the larger panel. Sometimes a woman will pick and choose from a range of different edging panels, according to her taste. Here is one of my very special 100% silk sinhs, worn in the traditional way with a matching silk overblouse. The occasion was a farewell party given when I concluded a two-year assignment as Manager of the Lao-Australia Basic Education Project. 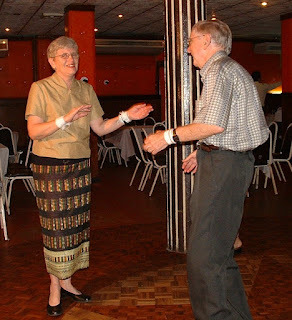 Allen and I are dancing the traditional Lao dance, the lamvong. I still have many of my everyday and special sinhs from our Lao years. I also have quite a few sinh fabric lengths never made up into skirts. It's these I use for cushion covers and other soft furnishings, such as the panels in these studio blinds. 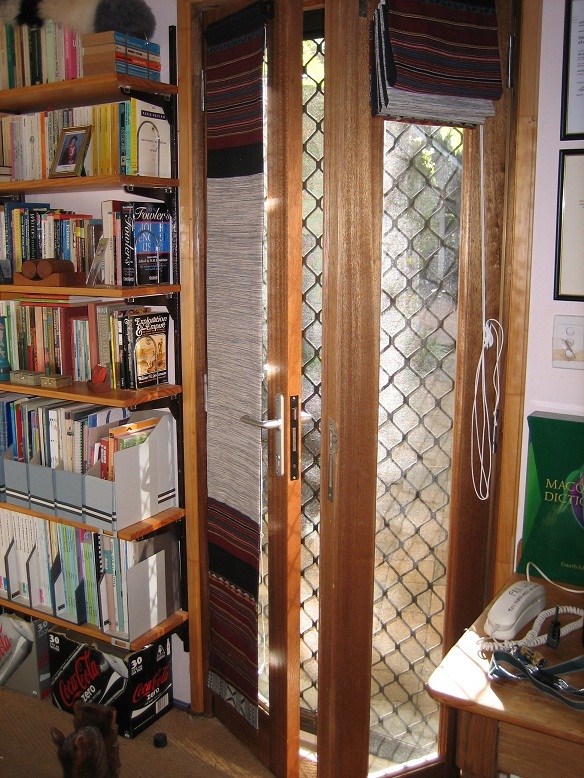 Incidentally, all the blinds are lined with a thick black cotton fabric to guarantee a longer life (and also to allow weekend visitors using the studio to have a good sleep-in). 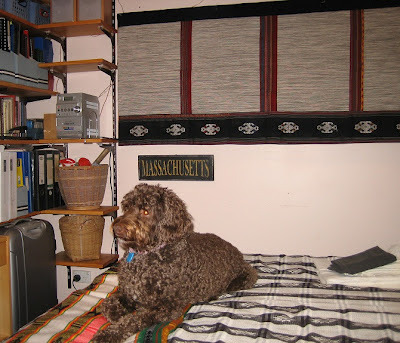 Hey, is that the word Massachusetts lurking on your wall? No doubt you put it there so you can remember how to spell it. Ha. I love your work and the fact that you care enough to do it. Well spotted, Snow. And in another post one day, I must explain why Allen and I appear to have bandaged wrists here! It wasn't a botched double suicide attempt, I assure you. "It wasn't a botched double suicide attempt..."
And if it had been successful, it would have been a splotched suicide attempt, so it's a mystery worthy of Holmes. Glad to know suicide is not on the list of sewing sinhs. I love your projects and that you are busy and happy. We are home and had a very relaxing 3 weeks with NO medical appointments. That was heaven as well as family and friends of decades. Nice to see you blogging. The roman shades are truly marvelous. I would love to do some of these things. Need motivation! I did buy some handmade placemats and napkins in a very different style at the Shaker Site craft fair this morning. An attempt to shake things up a bit. Lovely work :) but on a side note - what are you doing with my dog Sheba! Love the blinds. You do good work! 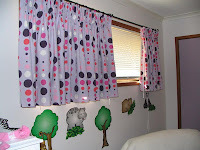 The drapes are absolutely cute! I'm finding it hard to sleep during daytime due to the excessive sunlight that enters our windows. 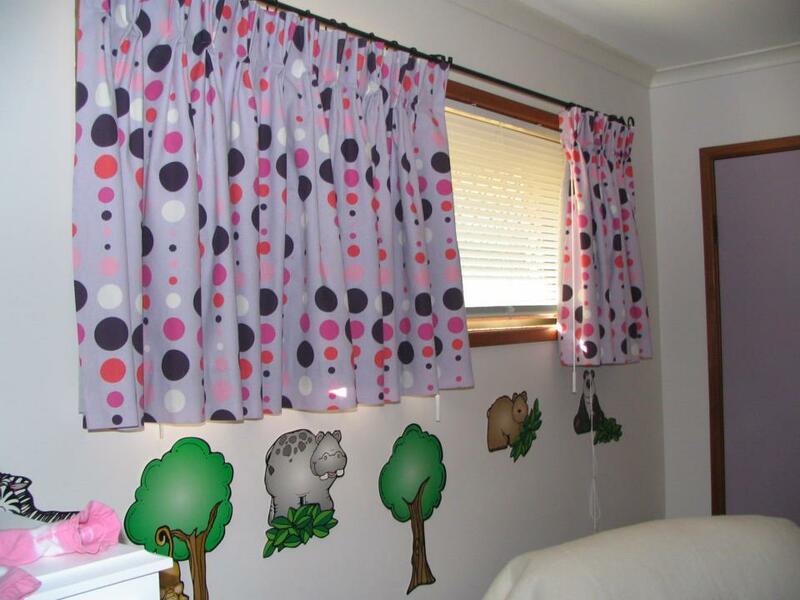 I'm sure these drapes will work in our bedroom. Thanks for sharing, Chartreuse!